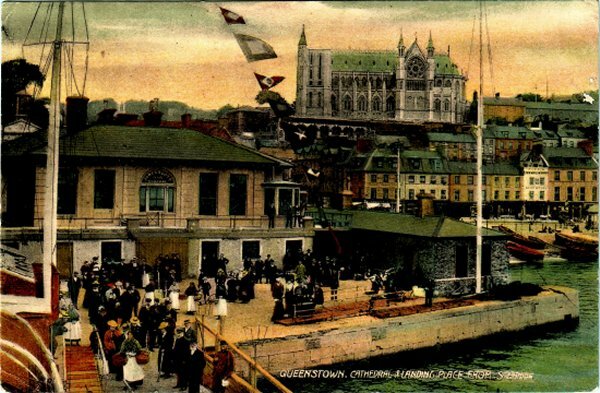 Postcard sent from Salem, Mass, on 30th August 1902 to Dublin, Ireland, and cancelled on board the Queenstown to Dublin train in September 1902. The card is franked with a 2 cent US stamp to pay the UPU surface postcard rate. The TPO from Queenstown via Dublin to Kingstown ran as required to meet the eastbound Cunard and White Star mail boats from the USA. The sorting service on the Queenstown to Dublin TPO commenced in 1869 once sorters had been withdrawn from the Cunard transatlantic service. 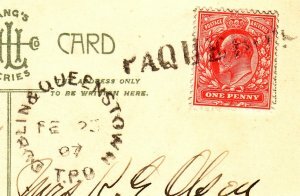 Initially called the "Dublin and Queenstown T.P.O (American Mail)", from July 1898 the service was simply called the "Dublin and Queenstown T.P.O". This type of handstamp is recorded as being used from 1892 to 1907. A view of the landing place at Queenstown, Ireland, taken from on board a steamer. This picture postcard is addressed to Stoughton, Wisconsin, and bears a DUBLIN & QUEENSTOWN T.P.O. postmark of 23rd February 1907. The KEVII 1 penny stamp is cancelled with a PAQUEBOT handstamp. One penny was the UPU postcard rate from GB to the USA until June 1921. The TPO ran as required to meet the eastbound Cunard and White Star mail boats. 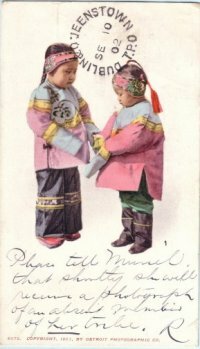 This postcard was mailed on board a British ship and cancelled with the PAQUEBOT mark on the TPO. It would then be bagged for dispatch westbound to the USA.